You are currently browsing the tag archive for the ‘Raw Deal’ tag. Perhaps the most succinct way of describing the conservative agenda of the last 80 years is that it exists entirely to deconstruct, demolish and disintegrate the reforms brought forth in Franklin D. Roosevelt’s “New Deal” in the 1930’s. In fact, if you were to outline the conservative agenda, you could just list all the reforms brought forth from the New Deal and then think of the exact opposite. Better yet: take that list of New Deal reforms and just cross them all out. The conservative agenda essentially doesn’t have a plan of its own; it exists only to tear down the plan set forth by the New Deal. If we recall, the New Deal was put forth in a brave attempt to thwart the pummeling economy during the Great Depression. It was a sequence of reforms aimed at giving relief to the poor, stabilizing our financial systems, and protecting the middle and working classes from uneven distributions of wealth. The immaculate success of the New Deal in saving the American economy was not just a shining example of vision and leadership, but its success also demonstrated the utter failure of everything conservatism stands for. Thus, conservatives have been vengefully dismantling the New Deal at every opportunity since its inception, and as a result they’ve just about put us back into another Great Depression. See, the real result of conservative economics is a total annihilation of the middle class, a radically uneven distribution of wealth between rich and poor, and complete deregulation of corporate plunder. Essentially, conservative economics aim for the same conditions which brought forth the Great Depression itself. And this diabolical agenda is all hidden under the overarching banner of “privatization”. Conservatives want to privatize everything, which basically just means they think our social programs would function better if their primary goal was in turning a profit rather than serving their purpose in the public interest. Unfortunately, this economic strategy, the simplistic naivete of laissez-faire economics, has been proven disastrous for the public interest at every turn, and for good reason. Privatization shifts the interest away from the public and instead aims at the interest of shareholders and CEOs. It’s such a proven failure that the conservative loyalty to these economic principles can only mean one thing: they’re more interested in making a buck than in serving the public interest. The latest example of all of this has been the recent debacle over bailing out mortgage giants, Fanny Mae and Freddy Mac. In reporting the event, what the media has seemingly failed to tell is the backstory. Fanny Mae, or the Federal National Mortgage Association (FNMA), was originally a government invention, one of Roosevelt’s– a nationalized program birthed right out of the New Deal. Its purpose was to help prospective homeowners to get loans and to put an end to the escalating list of foreclosures which exploded during the Great Depression. Before the New Deal, there were no long-term, self-amortizing mortgages. Thus, the New Deal is essentially what allowed the home-owning middle class to stay afloat. Most Americans today would not have their mortgages, or their homes, if it wasn’t for this program. The system worked like clockwork for 30 years. Home-ownership rates flew through the roof, as did the American economy out of the Great Depression. But in 1968, Fannie Mae was “privatized”, and Freddy Mac was created out of Fannie Mae in 1970 under the same principle. It took a couple of decades, but we’re seeing the failed consequences of this privatization today. Basically, it’s what happens when any public program is privatized: the program’s true purpose gets perverted so that a few insiders can get very rich. In short, here’s how it worked with Fannie Mae and Freddy Mac: Under private management, it went from an explicitly government-backed agency in the interest of the public to a privatized bottleneck in the interest of turning a profit for its insiders at the risk of the public. See, now that our government is bailing out the mortgage giants (a necessity at this point), the debt is being covered by the taxpayers, since it is their welfare which was always being risked. In other words, even while a privatized Fannie Mae and Freddy Mac were reasonably stable over the last 30 years, the risks were always held by the public. This allowed insiders to take risks (and rake in the profits from those risks) and make irresponsible gambles which is what ultimately led to the collapse of these companies, and the American housing market, which we’re seeing today; the likes of which we haven’t seen since the Great Depression. 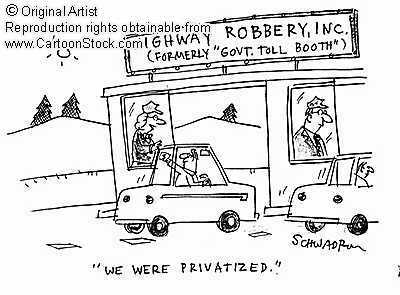 Basically, privatization meant that the insiders could take all the profit, while the public takes on all the debt. This is the same thing that would happen if we “privatized” Social Security, and all of the other programs created out of the economy-saving, job-saving, middle class revival that was the New Deal. Unfortunately, conservative legislatures and executives have so corrupted so many of these progressive, successful social programs, which we all rely upon for our modern standard of living, that the future looks as dismal as it does. Not even the public seems to understand the vast harm this conservative agenda stands to cause them. For the most part, the public seems seduced by the naive mantra of “privatizing” our government programs. If the bail-out of Fannie Mae and Freddy Mac demonstrates anything, it clearly shows the absolute failure of privatization. The public needs to open its eyes in its own interest and stand against the bastardizing of our society by the gluttonous hand of privatization. The choice for our next President is very clear given this conundrum: If John McCain is elected, it’s been hinted that the top financial guy is likely to be former Senator Phil Gramm, perhaps one of the biggest proponents for reckless deregulation and privatization the Senate has ever seen. Don’t be fooled: The conservative banshee of “privatization” is just a ploy to replace Roosevelt’s New Deal with a Raw Deal.